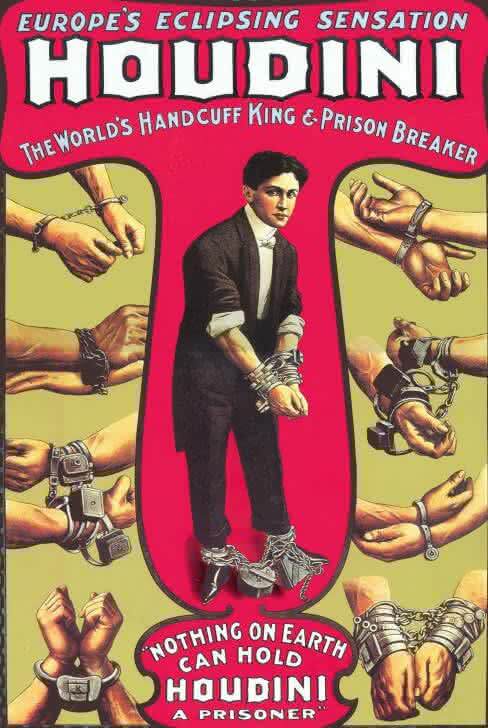 Houdini's Most popular poster declaring him as "The World's Handcuff King & Prison Breaker." This was used to advertise his performances at the height of his career. Houdini was well known for his escape magic. Escapes are what gave rise to his popularity as "The Handcuff King" and catapulted him into a successful career. The ability to escape from handcuffs and ropes took practice and determination. Houdini's book Magical Rope Ties and Escapes shows you what it takes to escape from some basic ties that are easy to get out of without much effort. Of course, a magician should always perfect their craft before performing before a live audience. Suitable for framing. Place this poster on your wall to keep you inspired on your magical journey. This is a replica, not the original.